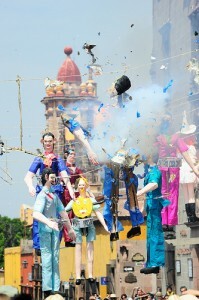 Today is a celebration of Jesus’ resurrection featuring huge piñatas that explode over the jardin. 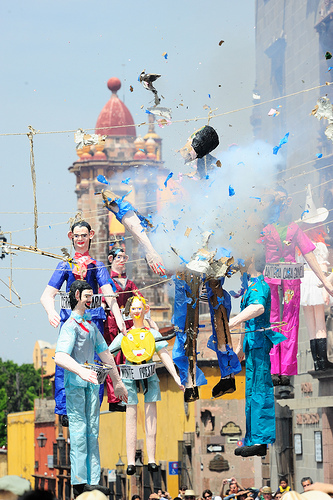 The piñatas feature politicians, Judas and celebrities not in good public favor whose dismembered paper body parts are quickly gathered by local children and sold to visitors. It is an emotional release of all the solemnity surrounding the time leading up to Easter and an exciting celebration of Jesus’ resurrection. Officially Easter begins Saturday night. Many will attend a wake for Jesus, go home for a large dinner and return for Easter mass at 10PM. The church may be engulfed in darkness until one lit candle begins the moving transformation to a fully candle lit church signifing Jesus’ resurrection.